Sydney based Start-up Arcspeed have announced Australia's first EV Sports car. 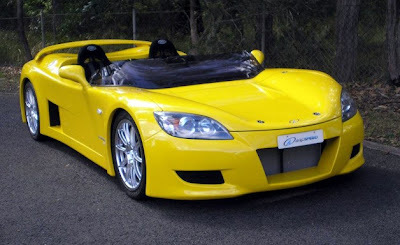 The Arcspeed Roadster is a full-electric sports car, designed and built using a unique all-Australian designed Can-Am styled body & chassis with locally sourced BLDC motor and controller, drive train, lithium batteries, battery & car management systems. The Arcspeed Sports equals Tesla Roadster performance, delivering 0-100 kph in a claimed 3.8 seconds. The main Li-ion battery array is under the cabin floor and is good for 150 km (90 miles) range with additional storage points designed into the chassis to double the range to 300 km (180 miles) at customer request. Arcspeed claims the car can be fully recharged in just four hours from a standard household socket, thanks to its dual onboard rechargers. The company founders are; Keith White, tech integration and marketing, Ian Denner, the engineer behind Cobra replica outfit Classic Revival and Jaron Ware, an electrical engineer who is on the national executive of the Australian Electric Vehicle Association. The guys have decided not to re-invent the wheel and will incorporate the ubiquitous tablet PC into the dash to control and monitor necessary functions. The car, which has been engineered to be easily built in right or left-hand drive, is still some ways off hitting the road - it still has to pass crash tests and the like - but the team have plenty of experience of this with the Cobra replica business and hopes to bring it to market late 2012 for less than $100k.